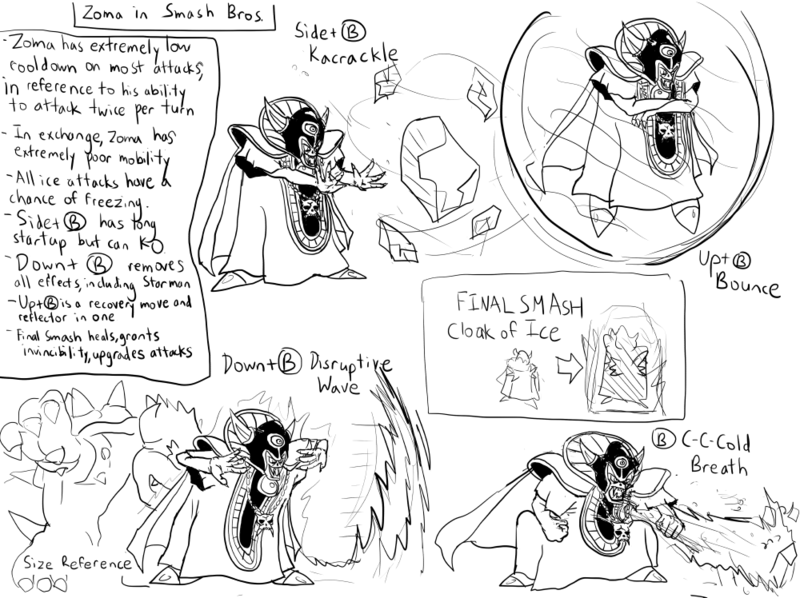 Zoma for Super Smash Bros. In celebration of Cloud Strife’s reveal as a new Super Smash Bros. for Nintendo 3DS & Wii U character, I have once again been drawing movesets and concept art for how famous icons of video games might work in Smash Bros. This time around, it’s Zoma, the final boss of Dragon Quest III, aka Dragon Warrior III. Square Enix began as two rival companies, Square (later Squaresoft) and Enix. If Square’s flagship title was Final Fantasy, and its greatest success story Final Fantasy VII, then Enix’s was Dragon Quest, and its crown jewel Dragon Quest III. Having sold over 1 million copies on its first day of release in Japan in 1988, which included many students deciding to cut class just to buy it, it is one of Japan’s most beloved RPGs. Amazingly, once you beat it, you find out that it was in fact a prequel to the very first Dragon Quest, and your player character becomes the legendary hero whose equipment must be collected in the first game. However, instead of just going with Loto (or Erdrick) as a counterpart to Cloud, I believe it would be more interesting if Enix could be represented by arguably its greatest villain. Zoma, like all Dragon Quest monsters, is drawn by Toriyama Akira of Dragon Ball fame, and strikes an imposing figure. A demon lord who rules over the land of Alefgard, according to Dragon Quest IX he actually went there because he’s extremely popular with other monsters and is trying to get away from his fans. Zoma is shown to be much larger than the heroes, but like Bowser there does not seem to be much consistency with his scale, so I figured he’d best be a large, heavy target similar to other super heavyweights. However, where Zoma differentiates himself from the rest is that his attacks are not only powerful, they’re very quick to recover. If you’ve fought a character like Mario in Smash 4, you find that he can move very quickly out of key attacks (Up Smash, down air, back air), and that it makes him difficult to punish. Zoma would be similar. While some of his attacks would have long wind-ups, such as his Side-B Kacrackle (the strongest ice spell in Dragon Quest), it is difficult to take advantage of him if he misses, as he can quickly transition into something like a jab or a forward smash. This is meant to reference the fact Zoma is actually able to attack twice in one turn in his source material. To balance this out, Zoma would have by far the worst mobility in the game, like if you weighed Ganondorf down with bricks. He would have decent jumps in terms of sheer distance, but would be extremely slow in terms of acceleration and max speed. His walk speed would be awful, and he wouldn’t even have a true dash. Instead, he would get a mini-teleport that still has all the restrictions of a dash. Think of him as being somewhat like Slayer in Guilty Gear. All of Zoma’s attacks come straight from his battles across various games (he’s been a guest boss in a number of titles), and many of them are capable of freezing. C-C-Cold Breath is a super-charged version of the Ice Climbers’ Down B, and Disruptive Wave can remove status changes (both positive and negative) and even stun opponents very briefly. In one-on-one situations you won’t be able to capitalize on it, but it does travel far and is good for shifting momentum back into your favor, especially given once again how difficult Zoma’s moves are to punish. Bounce is a reflector and stage recovery move combined, making it useful for getting past projectile-based edgeguarding attempts, but is otherwise below average for a recovery, traveling far but very slowly. It is also impractical as an on-stage reflector. Kacrackle is both a powerful damage dealer and a way to seal stocks early, but can be difficult to land. At the same time, it can be thrown out similar to Meta Knight’s forward smash as a read in neutral. Zoma’s Final Smash is a reference to the fact that Zoma originally covers himself with a protective ice barrier in Dragon Quest III that greatly augments his abilities. The only way to remove it is to use the Orb of Light, and seeing as no one has it in Smash Bros., I figured it would be better as a temporary measure. Perhaps most important of all, Zoma would have all of the signature attack sound effects from Dragon Quest. This entry was posted in smash bros, video games and tagged dragon quest, dragon quest iii, dragon warrior, dragon warrior iii, zoma. Bookmark the permalink.